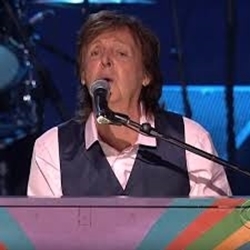 Sir Paul McCartney, Mariah Carey, Harry Styles, Katy Perry and more share their 'dreams' to mark ... . Beatles Radio: The Beatles, Solos, Covers, Birthdays, News The Fab 4 and More! Sir Paul McCartney, Samuel L Jackson, Mariah Carey, Katy Perry, Harry Styles and Meryl Streep are just some of the stars who have shared their "dreams" to mark the 50th anniversary of the Reverend Martin Luther King Jr's assassination. They joined the likes of Mary J Blige, Bruce Springsteen, Tiger Woods and Billie Jean King to pledge their visions for the future in a video on Wednesday. Music legend Stevie Wonder , who masterminded the tribute, urged viewers to share their hopes on Twitter under the hashtag #DreamStillLives in honour of the civil rights icon of non-violence, who was silenced aged 39 by a gunman. Former US president Mr Obama, joined by his wife Michelle, said: "Our dream is of a world where we recognise each other's common humanity and that we shape for our children, peace, justice and opportunity for all."